AFAA vs ACE - Which Training Certification comes out on top in 2019? ACE vs AFAA- Which Training Certification comes out on top in 2019? Hey ladies and gentlemen and welcome to my article on AFAA vs ACE in 2019. I know from tons of experience that choosing the right personal training certification can be very difficult. 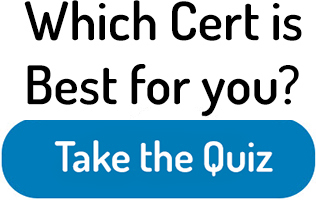 At the end of this article, you will have an exact idea of which of these two certifications is the better option for you. 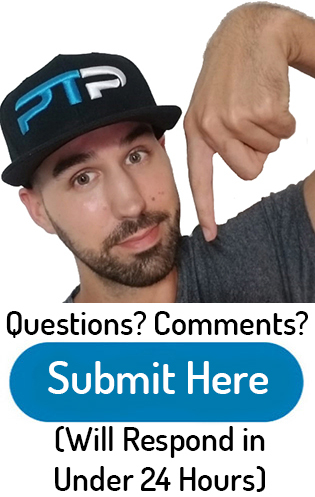 I also highly recommend checking out some of my other articles such as the comparison on the top five personal training certifications, as well as all the steps you need to take to become a trainer. Make sure to check out the ACE fitness website and AFAA site after for more details. I highly recommend that you Take the quiz to find out which personal trainer certification is the best fit for you overall. How much do ACE and AFAA cost? The AFAA has a stronger focus on aerobic training whereas ACE is more of an all-around general personal training certification. Both AFAA and ACE are well-recognized in the industry and are both NCCA accredited certifications. ACE requires 20 hours of continuing education every two years, whereas the AFAA only requires 15 hours every two years. Currently, the lowest price for the ACE certification is $599, while the cheapest from AFAA is $499. Compared to other personal training certifications, the AFAA has a stronger focus on aerobic exercise. Before they were called the athletics in fitness Association of America, they were called the aerobics and Fitness Association of America. On top of having a strong focus on cardiovascular exercise, they also have a slight emphasis on the psychology of exercise and habit-forming training similar to a lot of the health coach certifications. The AFAA has been around since 1983 and has certified approximately 350,000 people in over 73 different countries. This is one of the fastest growing certifications over the last 10 years or so. Especially since 2015 when the personal training giant NASM acquired AFAA because it’s also much potential in this ever increasing business. Since it was recently acquired by NASM, we can expect to see some remarkable changes over the next coming years with AFAA. It would be difficult to find a gymnasium or health club that does not except the AFAA as a valid personal training certification. Every single location that hires personal training excepts almost every NCCA accredited personal training certification. And because AFAA is accredited by the NCCA, you should have no problem with this training credential. The ACE personal training certification I would define as a general all-around personal training certification. Meaning that it does not truly focus on one area of training more than others. It has a very well-rounded approach for people just starting in the personal training business. The ACE certification was founded just two years after the AFAA certification in 1985. Since its inception, it has been one of the most extensive recognized personal training certifications in the United States. This also extends outside of the United States as it is one of the two certifications that is widely accepted in Europe as well. 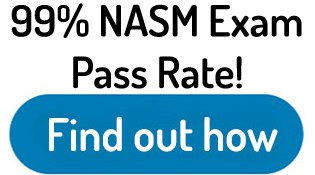 In case you are wondering, and NASM is the other. The ACE certification is well known for its IFT training model. This is a very popular model that helps trainers lead their clients through extremely effective and extremely safe exercise programs. This model has an emphasis on cardiorespiratory and functional training. Just like the AFAA certification, ACE is also accredited by the NCCA. Not only is the ACE certification extremely popular, but it is also the recommended certification by a large number of employers. As you can see below, here is an image over the last 12 months of what people are searching for on Google trends. As you can see from a popularity point of view, ACE wins hands down. Overall, the ACE personal training certification is recognized by a lot more people and institutions which makes it the winner for this category. Although you should have no trouble getting work with either certification. Since the majority of the AFAA certification is done online, the study materials are accessed online as well. At first, I was expecting a whole bunch of different interactive modules, online help, flashcards, and other useful study materials. Unfortunately, AFAA only really provides two sources of study materials. They give the study guide as well as 14 video lectures that can be accessed online. There are also some sample practice quizzes and tests that can be accessed online to help prepare you for the exam. There is a textbook for AFAA, but it costs $79 and is not included in the typical package that they offer. I found this extremely weird and kind of bothersome that they separate the textbook from the regular study package. Live workshops so that you can learn the personal training material with hands-on practice. This is an additional cost just like the textbook and will run you $199. You need to live in or nearby major city to take advantage of this unless you want to drive for hours or catch a flight there. With the ACE certification, things are a little bit more straightforward. Three separate packages contain different study materials in each one. The Pro essentials package does everything online except taking the exam itself. 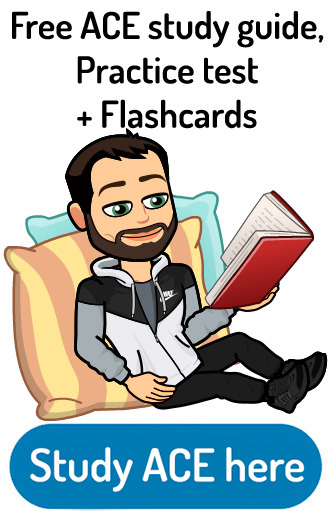 It includes practice tests, practice quizzes, access to ACE study coaches, the textbook in e-book format, a training manual to accompany the primary book, a fitness professionals e-book, access to the ACE Academy elite and access to other personal training resources. Out of all of these, I thought that the ACE Academy elite was cool because it helps concrete challenging to understand concepts using instructional videos and an easy-to-follow study blueprint. The Pro plus package includes everything that the Pro essentials package did with the addition of a hard copy of the personal training manual, a hard copy of the study companion manual, and a hard copy of the ACE essentials of exercise science for fitness professionals. If you are somebody that needs a hard copy to study from the book, this is the package for you. The Pro advantage package includes everything that the Pro plus package did with the addition of one important thing. The fitness map online course. This online math course will help you with difficult to understand topics that include math such as how to calculate the VO2 max, energy expenditures or body composition. If math is your downfall, this has saved a lot of people when it comes to those questions on the final test. Overall, ACE wins the study material section because it has a lot more options in different ways to study the material. Also because the primary textbook comes with every single package they offer which should be something that is default with every training certification. My ACE study guide is a must see in regards to study materials. The cheapest you are going to get the AFAA certification is for $499. This includes as I mentioned above the 14 videos, the study guide, some practice test, and access to take the online exam. If you want the official textbook, it will cost you $580. If you wish to the workshop with the textbook as well as the exam it will cost you $780. Check here for the current prices on AFAA. The price for the ACE CPT certification varies depending on which package you want to get. The cheapest packages the Pro essentials package at $599. The Pro Plus package costs $699, and the Pro advantage package costs $799. Check here for the current prices on ACE. AFAA wins for the overall price for the certification because it is $100 cheaper than the cheapest package from ACE. That being said, the most affordable package from ACE offers a lot more study materials and is overall a lot more helpful than the $499 package without the textbook from AFAA. To take the AFAA personal training certification exam, you must have a high school diploma or equivalent and have a current CPR/AED credential. It does not say on their website that you need to be 18 years of age like most personal training certifications require. To take the test you need to set a test date at a PSI testing facility. From the time that you purchase the AFAA certification, you will have one year to take the test. There are PSI testing facilities throughout the United States and Canada. The AFAA exam consists of 120 multiple-choice questions. You will get to complete hours to take the exam, and you must score a 70 or better. This does not mean you need to score 70 out of the 120 questions. You need to receive a 70 on a scaled score of 100. A scaled score means that there are different variations of the test. Some are harder, while some are easier. There is not an exact number you need to get right because you do not know if you have the harder or easier version of the test. The passing rate for the AFAA exam is 62% for first-time test takers according to the January 2017 statistics from AFAA. Essay mentioned in the quick info above, with AFAA you need 15 hours of continuing education every two years to get recertified. The recertification price is $99. You also have the option to pay $329 to re-certify for life and never have to pay recertification fees again (this does not include the cost of continuing education credits). To take the ACE tests you need to be 18 years old, all the high school diploma (or equivalent) and have a current CPR/AED credential. The only difference between AFAA and ACE is the requirement to be 18 years old for ACE. The ACE CPT has slightly more questions at 150 multiple-choice questions. Out of the 150 questions, 25 sample questions are not counted towards your score on the exam. Similar to the AFAA exam, the ACE test is graded on a scaled score. You need to receive approximately 500 points to pass the ACE exam. Although it is on a scaled score, this typically equates to getting 90 questions right out of the 150. You will have three total hours to finish the exam. After purchasing your package of choice from ACE, you will have six months to sign up and take the final exam. You can see a list of available test taking sites on the ACE website. The pass rate for first-time test takers with ACE is 65%. To get recertified with ACE you need to pay $139 and show proof of 20 hours of continuing education every two years. AFAA wins regarding the overall price for recertification and hours necessary of continuing education. ACE, on the other hand, has a slightly easier to pass the test. Make sure to check out my free ACE practice test here. I also recommend that you Take the quiz to find out which personal trainer certification is the best fit for you overall. 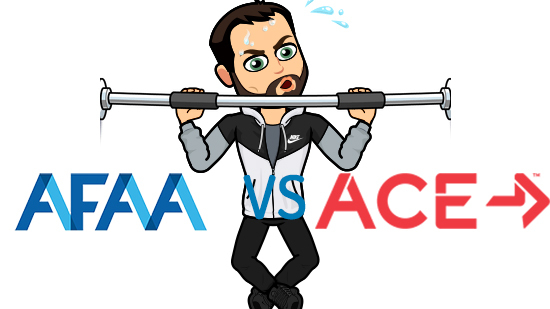 Well, that’s about it ladies and gentlemen on my comparison article between the AFAA certification and the ACE personal training certification. Which do you guys find to be a better organization, ACE or AFAA? For me, hands down, it is the ACE certification. If you are still having trouble figuring out which personal training certification to choose, take the test here to find out which one would be a great fit. Overall, both of these certifications are highly recognized in the personal training industry. Currently in 2019, ACE is the clear winner as the best personal training certification to choose. One of the biggest reasons is due to their IFT training model which makes it extremely easy to build individualized programs that are effective and safe for a wide variety of clients. 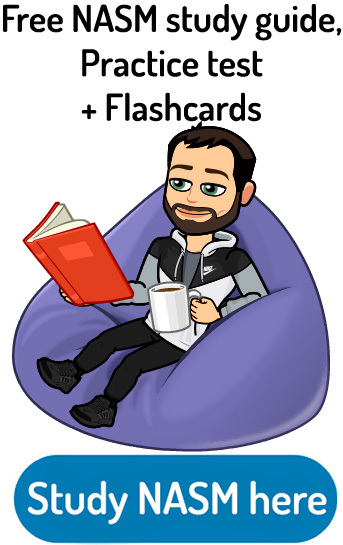 It also has a lot to do with the excellent study materials that they provide as well as the fact that they have a primary textbook included in all of the packages that they offer. They also provide access to fitness professionals in case you have any questions regarding the study material. I feel like I learned more from taking the ACE personal training certification compared to the AFAA. If you want to build a strong base of knowledge as a personal trainer, ACE is a fantastic certifying agency to start with. Make sure to check out my article on the top five personal training certifications as these two certifications are not the only ones to choose from. Drop a comment down below to let me know what you guys think of both of these personal training organizations. Are you guys certified with one or the other? What was your experience overall? If you have any questions, don’t hesitate to ask as I will respond to you as quickly as I possibly can.